Its turning out to be a good week for our predictions. After the announcement that Harbinger is going to build a new LTE ATC network, comes the news that Ryanair is discontinuing its in-flight connectivity service, after OnAir exercised its right to terminate the contract. 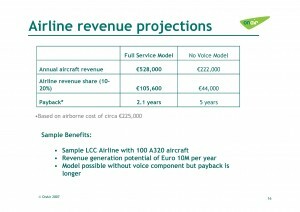 Though the termination apparently “puzzled analysts”, we predicted back in 2006 and reiterated in 2008 that there wouldn’t be enough revenue for both Ryanair and OnAir to make money from the service, and so the fleetwide deployment would never be completed. Thought Ryanair is putting a brave face on it, presumably in the hope of finding another sucker to take on the contract under similar terms and conditions, it was well known that the original contract was extremely unfavorable to OnAir (so much so that a major rival told us they wouldn’t touch it with a bargepole). We believe that Ryanair got a cut of revenues off the top, with OnAir left to pay for the terminals out of what was left after paying expenses for airtime, termination, etc. 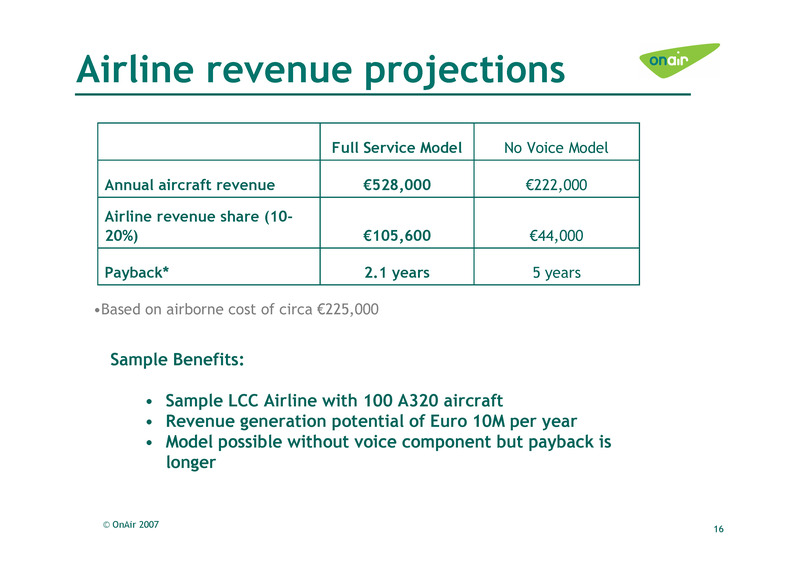 Unsurprisingly it was therefore virtually all upside for Ryanair (bar the cost of flying the equipment around), but financially disastrous for OnAir when revenues came in at a small fraction of the EUR528K per plane per year that was originally predicted by the two companies. It now seems that an approximation of reality is slowly returning to the in-flight communications market. Hopefully the next shoe to drop will be when Southwest doesn’t follow through on its fleetwide deployment plans with Row44, for exactly the same reason – there simply isn’t enough passenger revenue to pay for expensive VSAT or SwiftBroadband terminals, if both the airline and provider want to make a profit.